This month has fairly flown by as well. I’ve had a bit of trouble getting around lately so have been busying myself with things I can do at home and not exert myself too much. I’ve had a few days of wrist problems though so even crocheting was either very painful or just impossible due to frequent subluxations (partial dislocations) which is part of the Hypermobility/EDS “package”. I’m feeling content right now though because I finally, I mean FINALLY finished the green throw /blanket thingy for my living room. I started it in the beginning of May thinking I would have it finished by the middle of June but it took much longer than expected to finish as usual. It’s about 68”(173 cm) x 68”(173) cm—A large square! 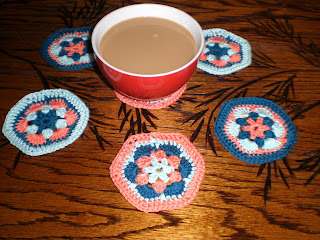 I used this yarn: http://www.hetkleinewinkeltje.nl/Webwinkel-Product-5259504/Glossy. for the body of it and this yarn: http://www.hetkleinewinkeltje.nl/Webwinkel-Product-11517928/Scheepjes-Isis-kleur-861.html for the trim . The shop does a very nice range of yarns with good service, very prompt delivery and reasonable costs. It started out as a circle and I did it in a basic granny square pattern. I increased the hook size after the first ½ meter or so around just for fun and (also because I had the idea that a larger hook would go faster ) and the slight variation can be seen here if you look carefully. It got a little bit bulky to work because it was so large though the yarn is very lightweight. I loved the feel of the silky yarn mixed with the cotton although it was a bit slippery and using a larger hook than normally would be used on this weight of yarn didn’t help. And this is where it’s going to reside along with new pillow covers I’ve been making with the old fabric remnants I’ve collected over the years. It’s adding a touch of colour and style while doubling as a comfy blanket for those afternoon snoozes. Why have a plain old sofa when you can dress it up with all sorts of hand made soft furnishings? I like changing them around from season to season or whenever I get bored with what’s on there at the moment. I’m not really pleased with the arm caps on the sofa (which are necessary around here for protection from clumsiness) and am thinking of something hooked rather than fabric……..
PS: I need to work on taking and fixing up photos . I have two cameras and never seem to be able to get the settings correct. They always look smaller and further away than they are. The past few weeks have just flown by so here I am trying to make at least one post for August. You have been a very big disappointment to all who love you. Instead of being sun-shiney friendly, warm and gentle you roared with your winds, shouted at us with your thunder and peed on us almost continuously. Note: I didn’t post yesterday as I said I would. I was feeling a bit fatigued and achy so took it easy yesterday. Recently while doing my shopping on the Albert Heijn website I was looking for my old Ajax cleaner and saw something called “Cleaning Vinegar” (it actually says Schoonmaak Azijn) but I’ve translated it for you. As I mentioned in my blog description I’m trying to live in a thrifty way. That means I need to save money where I can. I finally got around to changing my living room soft furnishings to the ones I use for summer. (You can see them in this post. ) Included in it was a silk throw and some rayon velvet pillow covers which were marked “Dry Clean Only”. I’ve had the pillows for about 12 years and they’ve never been cleaned. (maybe I shouldn’t admit to this) I occasionally spray some fabric freshener (which is homemade – recipe on request) and from time to time I stick them in the tumble dryer to freshen them up and deter/kill any mites, etc. that might be dwelling in the fabric. The throw is only a couple of years old but also had never been cleaned. So I reluctantly decided it was time to take them off to the dry cleaners. I gathered them up, put them in a bag and as I was doing that I was trying to guess how much it was going to cost. Plus I have trust issues with dry cleaners after a few bad experiences in various countries. I looked them over and got an idea. I chose one cover as the guinea pig and turned it inside out and zipper closed, put it into a lingerie bag to protect the fringe and put it in the washing machine ! I used some Woolite and set the machine on cold wash and a gentle spin cycle and crossed my fingers. When the wash was over I opened the bag and saw a wet but completely intact pillow cover! I laid it out flat on the clothes dryer and left it for about an hour and then I put it into the tumble dryer and set it on very low and for 10 minutes. When that was done the cover was still damp and I reshaped the seams a bit and put it back on the clothes dryer. A couple of hours later it was dry and perfect and clean smelling! The other pillow covers have now been washed and dried and ready for next winter. Now on to the throw: I put it in the wash but put the Woolite in the drawer instead of the dosing ball in the machine on top of the wash because I was concerned about possible spotting on the silk by the detergent pouring over it. In the drawer it’ll be diluted with water as it hits the wash. I set it on cold and low spin and crossed my fingers again. I was a bit concerned about the fringe and there was no mesh bag big enough to put it in. When the wash was over I took it out perfect, clean but wet. I shook it out and placed it in the tumble dryer on a low setting for 10 minutes. When that was over I took it out, shook it again and put it back for another 10 minutes. I did this so I could check on it and see if it was getting too hot in the dryer. I did these 10 minute increments for about 3 times and then took it out still a bit dampish to finish drying. And here it is along with the pillow covers, all clean, all intact and costing pennies for cleaning. Those “Dry Clean Only”tags have now been cut out. Those “Dry Clean Only”tags have now been cut out. Two notes here: 1) I folded the covers for storage before I decided to take photos hence the lines in them. I’ve now rolled them up instead so lines will be gone by then time I take them out again. 2) I only attempted to wash these items because they are all a solid colour. During the second and third week of March we were teased with a bit of Spring weather. Then we had a frost and were back into winter. Slowly but surely we’re working our way back into Spring. Thank goodness for that because my poor, achy joints can’t take much more of this damp, cold and rainy weather. I’m also glad because my tomato plants which I grew from seed are taking up space in my cramped living room when they should be outside on the balcony for the summer already. I'll be making progress reports on them as the Spring and Summer progress. Hopefully the next photos will be outdoors! Spring also brings new life and into our building a new life was born on Sunday morning when our upstairs neighbours welcomed a beautiful, tiny baby girl into their home and lives via a home birth. She’s absolutely beautiful and perfect and although she was late and her Mama was getting tired of being pregnant she chose to be born on Earth Day. I made a little gift to brighten her world and it’s been hanging in my living room for nearly 3 weeks now. It’s made with mostly natural materials: 100% cotton and wooden beads except for the “made with love” heart . I can’t vouch for it’s “natural-ness” but it’s very cute. It’s time to turn it over to baby Ilaria now. With love…….